Bundaberg is a dry part of Australia, with perceptions of hot, brown flat land. When tasked with a new land development in one of the more desirable areas of town, our first inclination was to look around. It is often said that every product or company has a story already waiting to be discovered inside it. With this one, we found close proximity to the river, and a leafier, greener suburb than most. And just like that, a new brand and its story was born. 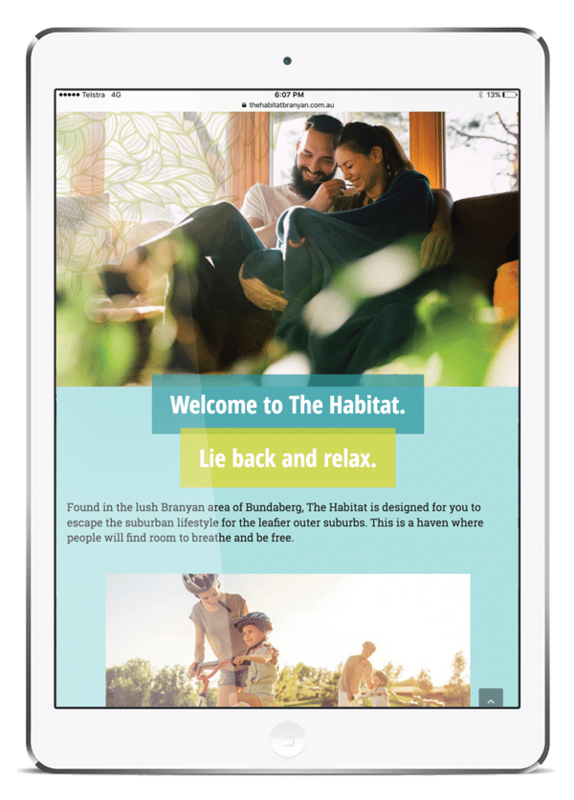 The Habitat brand evokes the velvet crush of lush grass, the dappled shade of green trees, and the soft rustle of cool, lazy river breezes. This is the coveted leafy riverside lifestyle of Branyan, promising backyard adventures though images of endless shady afternoons, open windows and a seamless indoor-outdoor life. A rich colour palette of Australian natives suggests a life far removed from the dusty browns of suburban Bundaberg. Sin deliberately avoided any warm tones in the brand. Subtle illustrative patterns of leaves, water and clouds add a touch of playfulness, reinforcing that this place is all about family. Yet it was not pitched as overly prestigious – a dream within reach of most local residents. Understanding the customer is core to everything Sin produces. Habitat’s customer was typically families looking for their second home. A chance to stretch out and live the great Aussie dream of backyards with trampolines and a bit of modern luxury for the parents. At the heart of this dream is happiness, so we added quirky elements like hand drawn clouds, and a signature leaping dog to epitomise suburban bliss. A community is all in the details. Habitat is a boutique 62 home development with an adventure playground park, proposed day care centre and community shops. Everything the upwardly mobile Bundabergian family needs, without the cheesy sales pitch. We use Sin for each development we do, and each time they simply get it right. It makes the selling job so much easier.